In the beautiful surrounds of Lake Macquarie, Ducks Crossing was born. Lake Macquarie has been one of the Hunter Valley's best kept secrets. It has over the past ten years or so become one of the best food and wine areas of the Hunter. Living up to this new tradition our DUCKS CROSSING is prepared to boast being the newest and most unique Restaurant in the area "Quackers" and Resort. Because of the many beautiful wood ducks that freely walk across the roads and the rural grasslands of this property the names were a foregone conclusion. As an Eco Tourism concept, the cosy cabins that quietly nestle in the inviting landscape are furnished with spas and a decor of yesteryear when the ladies wore white crinoline and the gentlemen strutted in fine dinner jackets depicting an era of elegance and definitely worth re-visiting. The freshness of the crisp linen being so inviting that you may just not leave your cabin. With the only Chef's Hat awarded Restaurant ever in Lake Macquarie "Quackers"
you can have a fantastic dining experience without leaving the resort. For the most rewarding and relaxing experience in the "get-a-ways" come join us at Ducks Crossing on Burton. Room & Breakfast Hamper Sun - Thursday & Full breakfast Sat & Sundays & public holidays when the restaurant is open. Hamper breakfast for 2 Weekdays with full breakfast on weekends & public holidays when the Restaurant is open. Fax from reception during restaurant open times. ADSL connection from each cabin BYO computer. Data Projector, Podium, Cordless & Fixed mikes, Flip chart, White Board available for seminars. Cinema Screen Available for outdoor Theatre, Training or Shows. 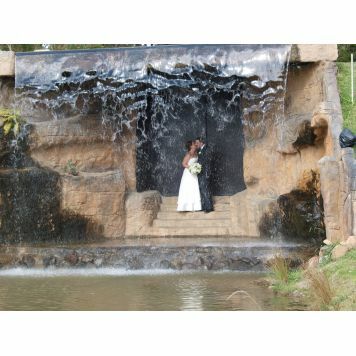 Laser Light shows available on Outdoor 6 metre wide Waterfall. No children in accommodation max 2 persons per room. Off street parking in our carpark at front of restaurant. 22 spaces available. 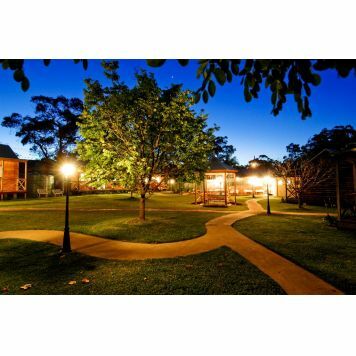 Stay at our oasis just minutes away from Newcastle City Centre and Lake Macquarie. Ducks Crossing is easily accessible via the F3 Freeway, Newcastle Link Road thru Cardiff & Warners Bay to Warners Bay Road then turn right onto Burton Rd. Why not be picked up by limousine and visit Newcastle, or the vineyards of Pokolbin, cruise the lake and make this holiday a Romantic Masterpiece that would melt any ladies heart.